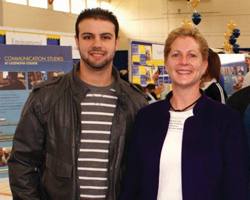 Senior Tom DeBernardis Shares His View on "Why Caz"
Tom DeBernardis, senior Communication Studies major from Utica, New York, delivered the following remarks to prospective students and their families at Cazenovia College's November 8, 2014 Open House. Good morning everyone. It is my honor to welcome you all to today’s Open House at Cazenovia College. I say it is my honor because it is truly a privilege to be standing before you today as a Cazenovia College senior, just four short years after I was sitting in this crowd with my parents as a prospective student. Today, I want to briefly talk about Cazenovia College and the amazing experience I have had at this remarkable institution. I’m hopeful that as you listen to me speak for the next few minutes, you will begin to recognize the prestige, tradition, and incomparable community that is Cazenovia College. I came to Caz as a freshman from Proctor High School in Utica, NY, a school with 2,700 students. Needless to say, Caz was quite the contrast. While there was some adjusting to college, I quickly adapted to this new environment – as a student, a baseball player, newspaper writer, radio host, and athletic advisory representative. And that was all in my freshman year. Now, I challenge you to find another undergraduate institution at which students have the opportunity to exhibit this same degree of scholarship, participation, and engagement in their first year. I guarantee you, you’ll be hard-pressed. It is the people – the professors, coaches, faculty, and fellow students – at Caz that make these opportunities possible for students. Though it’s a cliché, at this College, you’re far more than just a student ID number; you’re a unique and valuable member of the college community – without whom this school would seem just a little different. At Caz, you mean something to your professors, just as they mean so much to you. I know, just a few years from now, some of you will have met professors, coaches, and students from Caz with whom you will stay in touch the rest of your life. Yesterday, I got a text from my adviser, Maureen Louis, who I’ve been privileged to have as a professor for several courses. "I was just thinking," she said. "Tomorrow is open house, and you are a senior. I can still remember when I first met you and your parents." When I first met Maureen, I was a junior in high school and Caz was foreign to me. I didn’t know anything about the Communication Studies program or the opportunities through which I would grow intellectually and professionally. Today, some of you will meet Maureen, other professors and coaches who will come to play a vital role in your advancement as an undergraduate student. And they will genuinely welcome you to our community. This community will remember you; it will guide you, care for you, advocate for you, and invite you back for the rest of your life. Now, as with any freshman year, there’s some getting used to. Sure, living in a dorm isn’t the greatest and living with a complete stranger may seem weird at first. But I promise you, if you keep an open mind and embrace the experience, you will grow to love it and the students you meet will become your greatest friends. I’ll end with a brief story, with hopes it’ll encompass everything I’ve been talking about. Last year, I assisted the Office of Communications in creating a promotional video for the athletics department. One day last fall, I sat around a table with Wayne Westervelt, the vice president of marketing and communications, Cory Schad, a 2009 grad and my assistant baseball coach, and Mike Brooks, our head basketball coach and director of athletics. If memory serves me, it was Mike who paused amid our discussion, and noted the profoundness of my participation in this endeavor. "Isn’t it awesome," he said, "that at Caz, someone like you – a student-athlete – has the opportunity to assist in a project like this." I thought about it for a minute, and soon I understood exactly what Mike was talking about. At Caz, you’re not a student or an athlete; you’re a student and an athlete. At Caz, not only can you participate at the radio station, but you can also write for the newspaper, or join philosophy club, or social science club, or communications club, and so on. At Caz, professors don’t preach to you – they talk to you, they challenge you – they tap into your deepest intellect. At Caz, not only can you sit at the top of your class, but you can also become the most valuable player of your team. At Caz, you have an unmatched capacity ... to build your future.